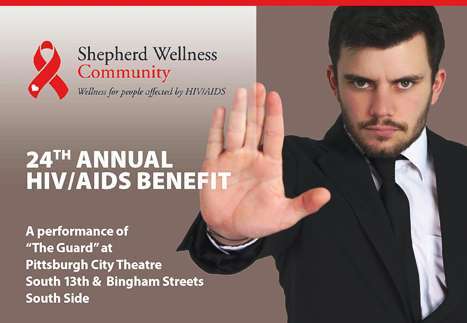 Join us for the 2017 Shepherd Wellness Community HIV/AIDS Benefit! The evening will begin with a reception at 5:30 p.m. including an open bar, hors d'oeuvres and bidding on our fabulous silent auction prizes. Performance begins at 7:00 p.m. Following the performance, enjoy a dessert and coffee social and pick up your auction prize. This year our exciting City Theatre performance is entitled The Guard a new play by City Theatre favorite Jessica Dickey. When dedicated museum guard Henry dares to truly connect with the paintings he proudly protects, he sets into motion a time-bending journey where art intersects with life. Inspired by Rembrandt’s “Aristotle with a Bust of Homer,” The Guard embraces the idea of carpe diem in (and at) any age, and takes audiences on a spellbinding theatrical exploration of the power of human connection. TICKETS PURCHASED AFTER FEBRUARY 23RD WILL BE HELD AT THE DOOR. Proceeds from this event benefit the HIV/AIDS services of the Shepherd Wellness Community.